The moment is finally here! Here are the 2016 Teens’ Top Ten Nominees! This year’s list of nominees features 26 titles that were published between Jan. 1, 2015 and Dec. 31, 2015. Bardugo, Leigh. Six of Crows. Macmillan/Henry Holt & Co.
Black, Holly. The Darkest Part of the Forest. Little, Brown & Co.
Boecker, Virginia. The Witch Hunter. Little, Brown & Co.
Childs, Tera Lynn, and Tracy Deebs. Powerless. Sourcebooks Fire. Cornwell, Betsy. Mechanica. Houghton Mifflin Harcourt/Clarion Books. Dinnison, Kris. You and Me and Him. Houghton Mifflin Harcourt/Clarion Books. Doktorski, Jennifer Salvato. The Summer After You and Me. Sourcebooks Fire. Doller, Trish. The Devil You Know. Bloomsbury. Heltzel, Anne. Charlie, Presumed Dead. Houghton Mifflin Harcourt. Kaufman, Amie, and Kristoff, Jay. Illuminae. Random House/Alfred A. Knopf. Matharu, Taran. The Novice: Summoner: Book One. Macmillan/Feiwel & Friends. Nielsen, Jennifer, A. Mark of the Thief. Scholastic/Scholastic Press. Niven, Jennifer. All the Bright Places. Random House/Alfred A. Knopf. Priest, Cherie, Illustrated by Kali Ciesemier. I Am Princess X. Scholastic/Arthur A. Levine. Schmidt, Tiffany. Hold Me Like a Breath. Bloomsbury. Schreiber, Joe. Con Academy. Houghton Mifflin Harcourt. Simmons, Kristen. The Glass Arrow. Tor Teen. Westerfeld, Scott, Margo Lanagan, and Deborah Biancotti. Zeroes. Simon & Schuster/Simon Pulse. Yoon, Nicola. Everything, Everything. Random House/Delacorte Press. A full list of the nominees with annotations can be found at www.ala.org/yalsa/teenstopten. Encourage teens to read the nominees throughout the summer so they are ready for the national Teens’ Top Ten vote, which will take place August 15 through Teen Read Week (October 9-15). The 10 nominees that receive the most votes will be named the official 2016 Teens’ Top Ten. In celebration of the nominees being named, YALSA will be giving away 40 sets of the nominees through its 2016 Teens’ Top Ten Book Giveaway, generously funded by the Dollar General Literacy Foundation. Interested applicants can apply now through May 1, 2016 via this online form. 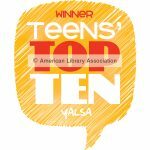 Learn more about the Teens’ Top Ten at www.ala.org/yalsa/teenstopten. 2016 Teens’ Top Ten Titles Announced! 2017 Teens’ Top Ten Announced!